Lake MassokoCan new species really evolve if there is no physical boundary to drive genetic separation? Physical and genomic evidence from the 700-metre wide volcanic crater Lake Massoko appears to have caught the process in the act. The results of studying the whole-genome sequences of 146 small fish in a tiny lake in Africa may help answer a decades-long debate among evolutionary biologists. Can a new species evolve if there is no geographic barrier to physically separate the new species from the old (sympatric speciation)? And, if it is possible, what are the genetic and physical traits that drive this form of evolution: sexual attraction, or specialisation in lifestyle, diet or other ecological factors? A benthic ecomorph of a cichlid fish living in Lake Massoko.Cichlid fish are a valuable model of evolution. In nearby Lake Malawi, many hundreds of cichlid species have been found, differentiated by size, shape, colour, feeding habits and ecological preferences such as living towards the surface of the lake or at the bottom. 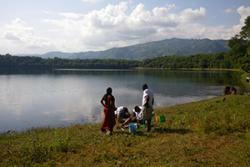 Because of this vast diversity the lake is known as “Darwin’s Pond”. In contrast Lake Massoko is “Darwin’s puddle”: a much simpler place with many fewer species and fewer factors to drive speciation. 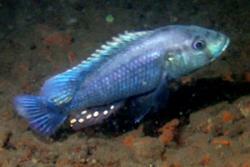 In the lake, researchers discovered two significantly different forms (ecomorphs) of a common species of cichlid fish. One ecomorph – known as littoral – has yellow-green males and lives towards the shores of the lake. The other form – benthic – has dark blue-black males and lives towards the bottom of the lake where the light levels are much lower. There are many other measurable differences between the ecomorphs, for example in body shape, jaws and diet. These differences are reflected in the genetic differences observed when whole genomes from the two ecomorphs were sequenced and compared. The majority of significant genetic variation lay in a small number of genomic regions associated with sight (such as rhodopsin and other twilight-associated genes), hormone signalling, size and shape. A yellow ecomorph found in Lake Massoko.Confusingly, no single factor – either genetic or physical – seems to separate the two morphs: although they prefer different depths, the yellow and blue fish are frequently found together. One theoretical model for sympatric speciation is that sexual selection can reinforce differences via mate preference. The investigators also carried out mate-choice experiments between the ecomorphs in a controlled laboratory setting and found some differences, but again not enough to explain the separation by themselves. An exciting prospect is that these findings in a simple system will be relevant to understanding the much richer and more dramatic evolutionary radiation in Lake Malawi and the other African great lakes, and indeed beyond.